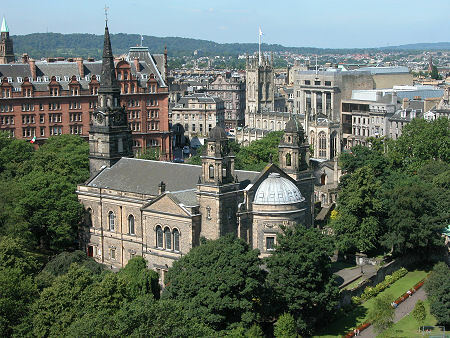 St Cuthbert's Parish Church stands at the west end of Princes Street Gardens near the junction between Princes Street and Lothian Road. Surrounding trees, and a location shielded by the more obvious Church of St John the Evangelist mean that for such a large church it is surprisingly retiring. By far the best views of it are from the western end of Edinburgh Castle. Even those who have only glimpsed St Cuthbert's through the trees might well have heard it, however. The sound of a full peal of bells ringing out from a church is a sadly rare one in Scotland. But if you stroll through this part of Edinburgh when the bell ringers are in full flow it brings home what a glorious sound church bells can make: all the more so if you hear them in the evening, when the traffic noise from Lothian Road has abated slightly. St Cuthbert's can be accessed from Princes Street, Lothian Road, King's Stables Road or from the Gardens. 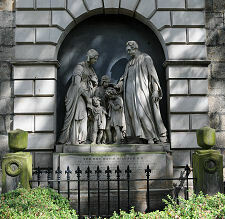 Set within a churchyard that is home to a fine collection of blackened gravestones and numerous trees, the most striking feature as you approach from Lothian Road is the memorial to the Rev David Dickson DD, who died in 1842, set into the exterior of the west wall of the steeple. This is topped off by life size statues of the Rev Dickson, his wife, and their three children. It is quite difficult to gain any real appreciation of St Cuthbert's from the churchyard. As you view it from different angles, you are presented with a series of partial views of what almost seem to be disassociated pieces of architecture. The entrance is via a door near the west end of the south face of the church. 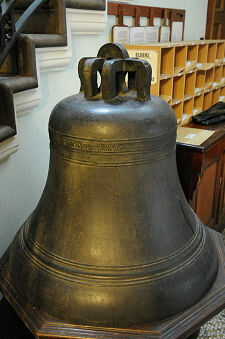 This brings you into a grand vestibule which runs across the church and is home to a number of fine monuments, and to a large bell dated 1791. A door off to the right of the vestibule brings you into a large reception and meeting space, one side of which is used as a gift shop stocked with items relating to the church. Further doors take you through into the sanctuary of the church proper. This is, quite literally, a breathtaking space. 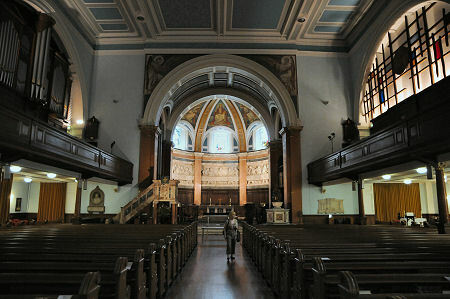 As you stand at its western end the central aisle between the dark wooden pews leads your eye directly to the fine arch at the eastern end, and the incredibly ornate apse beyond. There are galleries on three sides, and the visual effect of the arch is reflected in the surrounds to the organ pipes on the northern side, and the matching blind arch high on the southern wall with a modern decorative motif. This was created by Edinburgh College of Art in 1990 and the central section shows a young St Cuthbert as a shepherd tending his flock in the Lammermuir Hills. Before leaving the west end of the sanctuary it is worth looking at the wooden war memorial commemorating members of the church, which surrounds the door through which you entered. The true glory of the east end of the church only becomes obvious as you approach it. The large pulpit, together with the font and communion table, are constructed mainly of marble from Italy and Egypt. But it is the apse, beyond the arch, which really dominates the interior of the church. This is highly ornate. Here, however, the marble is overshadowed by two more striking features. The ceiling of the apse was beautifully painted in the 1920s and 1930s. Below the line of windows around the apse is its most outstanding feature, an alabaster frieze featuring Jesus and his disciples and based fairly closely on the famous painting of the Last Supper by Leonardo da Vinci. Today's pulpit stands on the spot which, according to tradition, was the location of the first church to be built in Edinburgh. It is said that St Cuthbert	came here from his home in the Scottish Borders to preach in the latter half of the 600s, and some believe that St Cuthbert's was the church referred to as standing in "Edwin's Burgh" in 854. Others believe that this was actually a reference to a predecessor of St Giles' Cathedral. The first indisputable evidence of a St Cuthbert's itself can be found in the oldest document in the Scottish Records Office, which is a charter of 1127 by King David I granting the land immediately to the north of Edinburgh Castle (now part of Princes Street Gardens) to St Cuthbert's. The church he granted the land to must already have been established at this point, but many believe it only came into being 50 years earlier. St Cuthbert's was rebuilt a number of times over the centuries. On at least two occasions this followed the destruction of parts of Edinburgh by English armies: when Richard II invaded in 1344, and when the Earl of Hertford did so on behalf of Henry VIII in 1544. More damage was suffered in 1573 when defenders in Edinburgh Castle fired on an English artillery battery set up close to the church. 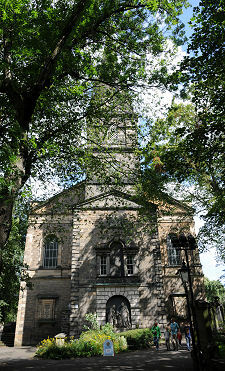 Then Oliver Cromwell's troops were stationed in the church in 1650, and on departure left it "altogider spoyled". On Sunday 27 September 1772, a church whose condition had been deteriorating for decades was adjudged to be in danger of imminent collapse. Work began on a replacement church almost immediately, and the new St Cuthbert's was completed in time for a first service on 31 July 1775. A steeple was added to the west end in 1789. The church that emerged reflected both the need for speed in its construction and the need to accommodate a large local population arising from the development of Edinburgh New Town. It has variously been described as "a God box" and "a great barn". In the early 1890s it was decided that a replacement was needed, and the church you see today was designed by local architect Hippolyte Blanc and built between 1892 and 1894, retaining the 1789 steeple at the west end. During its construction, evidence was found of no fewer than seven distinct earlier churches on the same site. The west end of the interior was remodelled in 1990, when a new wall was inserted to reduce the size of the sanctuary, creating space for meeting rooms and other accommodation to the west.